St. Constantine the Great was one of the pagan Emperors of Rome, but set out to restore peace and order when his fellow pagan Emperor Maxentios was tyrannizing much of the western empire. Just before his battle with Maxentios’ superior forces, Constantine beheld in broad daylight a shining cross on which were inscribed the words, “In this sign, conquer!” He ordered replicas of this cross to lead before his army, and Maxentios was defeated in 312, leaving Constantine as the sole Emperor of Rome united. St. Constantine signed the Edict of Milan in a.d. 313, which stopped the fierce persecution of Christians which was going on under Diocletian. He moved the seat of the Roman Empire to New Rome, or Constantinople, in a.d. 325 and chaired the First Ecumenical Council in the same year. 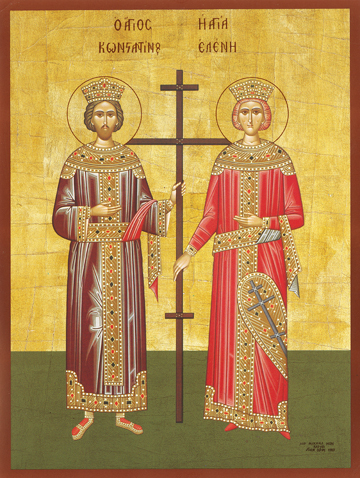 St. Constantine died in 337. St. Helen was the mother of St. Constantine and the consort of the Emperor Constantius (who ruled from a.d. 293 to 306). She had converted to Christianity earlier. Later she went to Jerusalem and the Holy Land to discover the sites of many places made sacred by Jesus, and helped build churches there. She died peacefully in 330.